If you want to learn SEO copywriting, this is the guide for you. Higher rankings, more traffic, and a bigger bottom line await! It’s knowing how to include your keywords naturally – so that it’s appealing to read, entices your readers to scroll further down the page, and doesn’t earn a penalty from Google. For example, in the beginning of this article I used short sentences and an enticing value proposition that also included my keyword: “SEO copywriting”. That’s just one of the cool tips you’ll learn in this guide! I’ve spent the last five years as a copywriter and SEO consultant, so I’ve discovered a thing or two about blending the fields together. 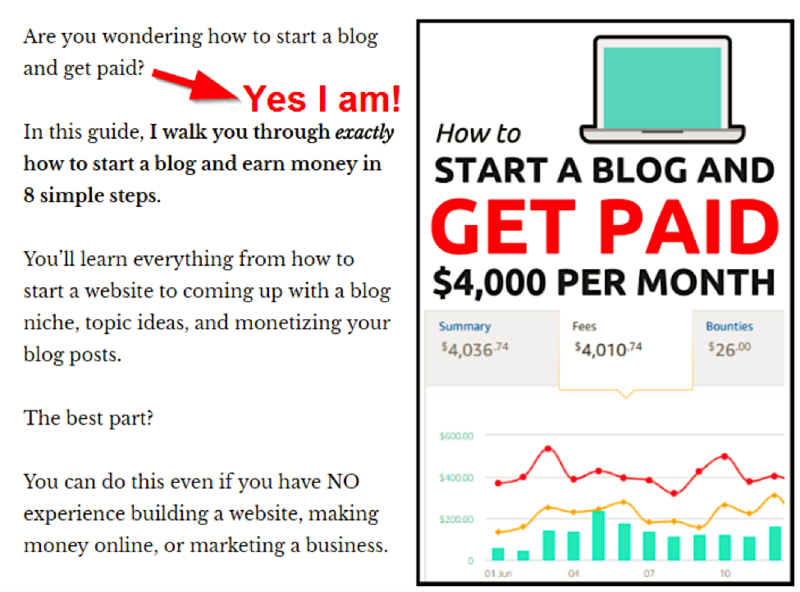 You’re about to learn all my copywriting secrets! The following simple SEO copywriting tips work for every business, no matter the industry or customer. I’ve used them across e-commerce stores, agencies, SaaS companies and even on our RV blog – and they work like a charm every time. 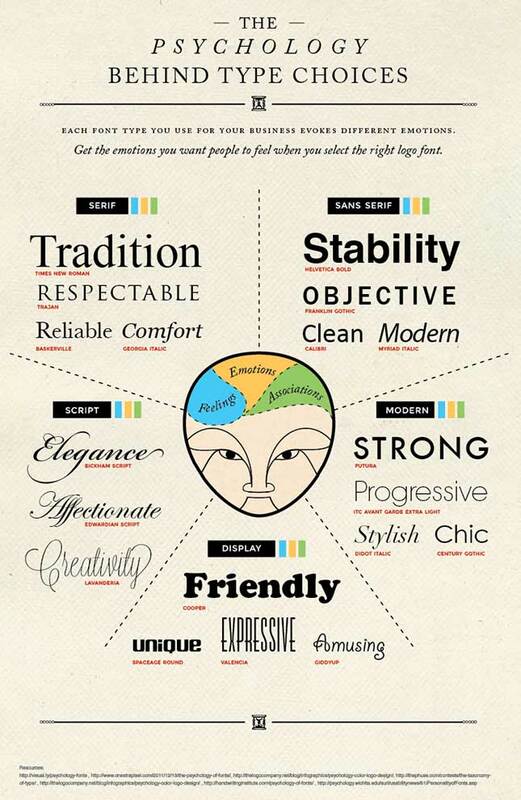 All good copywriting starts with a buyer persona. 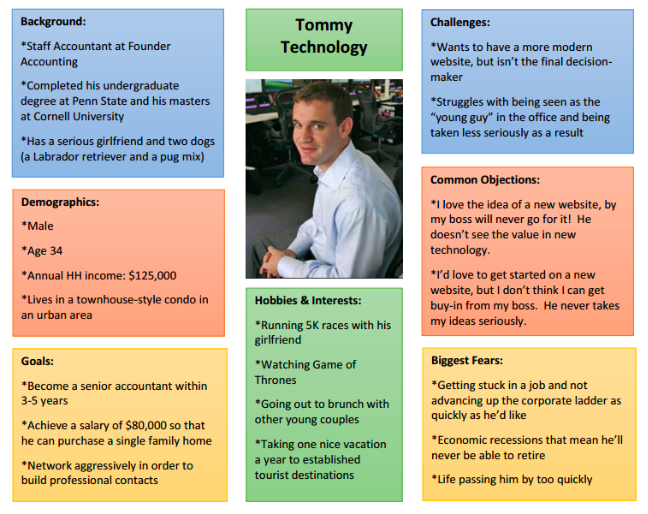 A buyer persona is a document of a fictitious person based on market research. It reveals information on your target audience, such as their age, gender, interests, hobbies, pain points, etc. This is important because it helps you understand who you’re talking to and what their desires, goals and fears are (so you can dial up their pain points and get them to take action on whatever you’re writing about). One of my favorite “shortcuts” to full-blown market research is browsing forums. Dedicated forums are great places to see exactly what people are struggling with, and even the words they’re using to describe these pains and hopes. “Looking for a wireless smart parking sensor that’s easy to install? Our wiziwig parking sensors are neither complicated nor expensive. Even if you’re not much for wiring anything, you could install these in a snap! See how that works? 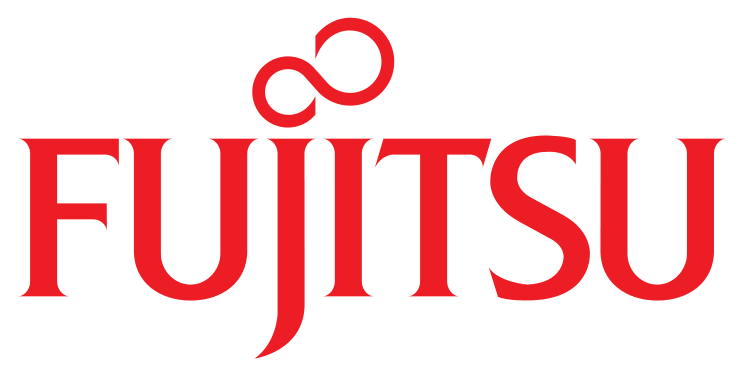 Now you’re speaking your customer’s language! If you need help finding forums, just Google “[your keyword] forums” or take a look on Find a Forum. *This is totally made up. But it got your attention, didn’t it? Try to include a number in your headline. Headlines with numbers tend to get more clicks in the SERPs. 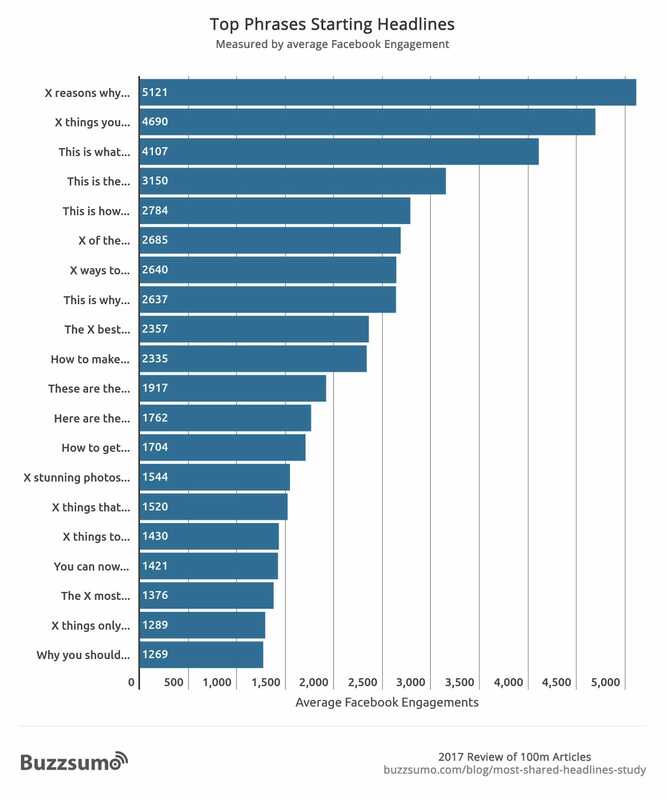 The highest engagement rate on Facebook were headlines that began with: numbers 10, 5, 15 and 7. Posts with twelve to eighteen words in the headline receive the highest number of Facebook engagements on average. Besides numbers and phrases, you should also strive to use headline formulas that have been proven to work well. For example, how-to and list posts are some of the most popular articles on the Internet. About 80% of people will read your headline, but only 20% will read the rest of your content. So if your headline has done its job, people will click to read the whole article. But you’re not done yet! After your headline, your introduction to the article is extremely important for engaging your readers enough to ensure that they don’t leave. If the intro is vague, unclear, written poorly or too long, you’ll lose that 20% who opened your article. Luckily, writing an enticing intro is pretty easy. Just use the APP method: Agree, Promise, Preview. Immediately, I get my readers to say “yes”. 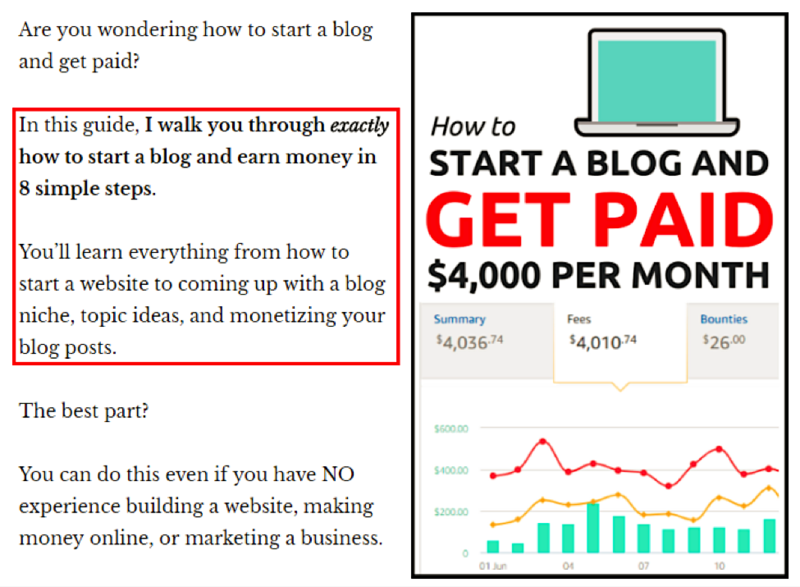 Following that, I make a simple promise: I’ll walk you through how to start a blog and earn money. Once you’ve got your reader nodding in agreement and have made a promise to them that the article is worth their time, you must end with a preview of what they’re about to get. If we scroll down, you can see how I did this in my article. I showed them a preview of the traffic numbers and how I outranked Amazon for a highly competitive keyword. Big paragraphs look scary, especially on mobile, and tend to drive people away before they even get to the heart of your content. Short sentences are easier to read – which means more people will read them. As famous advertising expert Joseph Sugarman explains in his book The AdWeek Copywriting Handbook, the purpose of the first sentence is to get your reader to read the second sentence. The purpose of your second sentence is to get them to read the third. The purpose of the third sentence? You get the idea. You already know that your article’s title is important. But what about your section titles – or headlines? If you’re not already, you should be using headings and subheadings to break up your content. In fact, I always start every article I write with a solid outline that includes all the headings. Not any old heading will do, though! While it’s usually better to be clear rather than clever, some copywriting in your section headings can increase the readers’ time on page and improve your rankings. For example, look at the headings I’ve created here. This section could have been called “write good headings”. But instead I called it “Break up your content with ridiculously compelling headings”. Which sounds better to you? Another example would be using actual number results in your headings. For example, a great subheading might be “Use this SEO copywriting secret to increase time on page by 2 minutes”, followed by a strategy with a case study or proof to back it up. 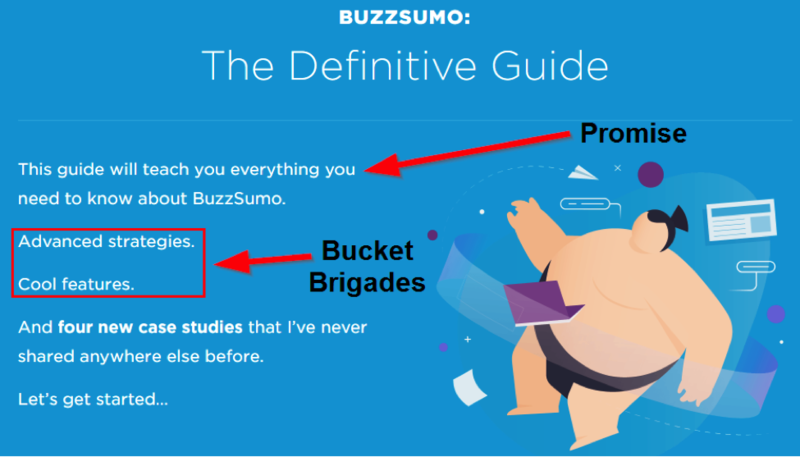 You’ll find more SEO copywriting examples in the last section of this guide, but for now, let’s move on to the super secret copywriting strategy: bucket brigades! I first learned of bucket brigades from legendary advertiser Joseph Sugarman. What’s a bucket brigade, you ask? Confused? Basically, a bucket brigade is a very short sentence or phrase that forces the reader to read the next line to get more context. If you look back through this article, you’ll notice I use them pretty frequently. You’re about to learn something amazing. By getting your reader to read just one more sentence…then one more sentence…then one more…you get them to “fall” down your article like a “slippery slope”, increasing your time on page and engagement rate. Media isn’t exactly copywriting, but it’s still very important to search engine optimization copywriting. Why? Because images and video done well can draw your reader’s eye to key points and takeaways, keep them interested (no one likes dense blocks of text), and increase their time on page – and thus, your rankings. Plus, using high-quality images can help you rank on Google image search. Keep in mind that stock images may hurt your ranking (because people are unlikely to click on a stock photo that comes up in search results, Google Google images would lower the ranking of that image compared to other more appealing images. ), meaning Google images would lower the ranking of that image compared to other more appealing images. ranked nor will the exact same picture from different websites or blogs be shown multiple times (just as duplicate content is penalized, so is duplicate images). Have a proper file name. “Image123.jpg” is no good. Instead, aim to include your primary or LSI keywords in your title. For example, I might name my images for this article “SEO-copywriting-tips”, “SEO-copywriting-examples”, or “B2C-copywriting-headlines”. 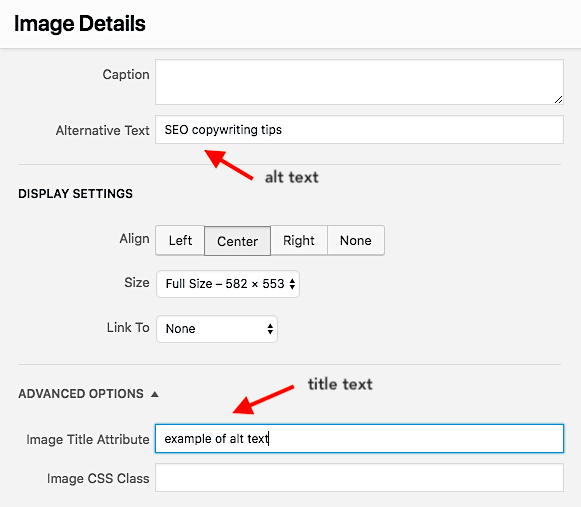 Use proper alt text and titles on your images. Usually I make the alt text the same as the image file name, without the dashes. For the title, I just explain what the image is of, so if anyone hovers over it they can get some more info. Compress your images. This is important for page load speeds. Aim for less than 70kb per image file. You can use a tool like Gimp to do it for free. But know this: not just any old image will do. Long gone are the days of stock images and random graphics that hold no value. Your images must be relevant to the article and of value to the reader. Occasionally, high-quality stock images that relate to your content can work if you need something to break up long stretches of text, as long as they are interesting and creative. Before you download a stock photo, though, see if you can break up the text in other ways, like with bullet points, a video, a heading, a quote block, or a visual break of some kind every 150-300 words. 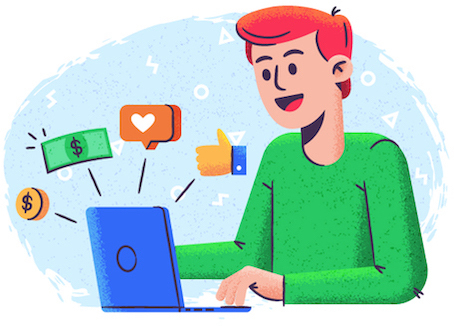 Just like images, your site’s design can boost dwell time and conversion rates – which in turn increases trust with your readers. Want some examples? Keep reading! In this section, I’ll share two SEO copywriting examples I thought were particularly powerful and interesting. The first one is an example of bucket brigades and using humor, and the second is an example of great design combined with great copy. Brian uses a straight-to-the-point approach to get people hooked into the guide. He makes a promise and then uses bucket brigades to push you down the page. If you scroll through the guide, you’ll notice he uses almost every tip in this copywriting guide. He builds immediate trust (and branding) through high-quality design. As soon as you scroll down, you get a well-designed table of contents, which helps the reader get to where they want to go and improves time on page. Each “chapter” has a summary which, like the opening to the guide, is right to the point, makes a promise of what you’ll get from reading, and uses bucket brigades. There are tons of screenshots to show you what he’s talking about. This makes the article easier and faster to read and comprehend. All of his section headings provide a direct benefit. You know exactly what you’ll get if you read those sections, and the benefit sounds so enticing you want to read it. 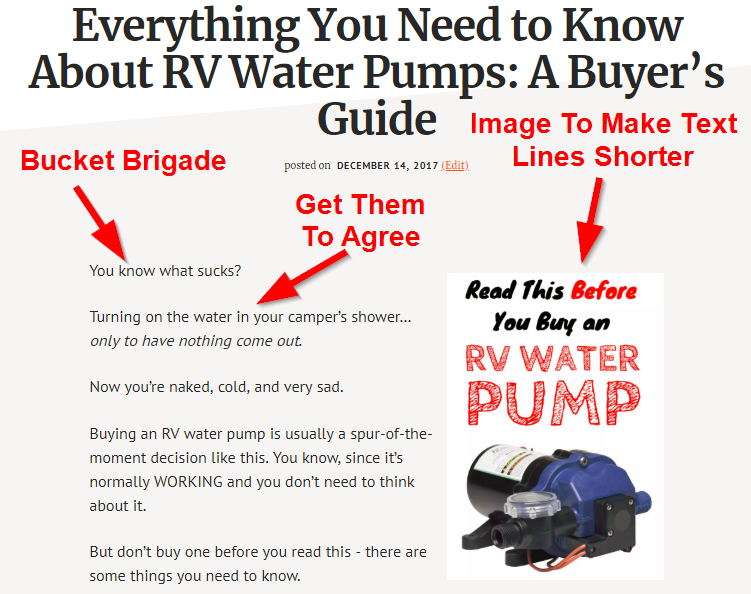 I wrote an RV water pump buying guide that I’m particularly proud of, and think it’s a great example of the tips you’ve learned in this guide. (It’s also #4 on Google for “RV water pump”). If you followed this guide, you’re now familiar with seven of my favorite advanced SEO copywriting tips to improve your search rankings and increase your conversion rates. Regardless of the industry you’re in, these are SEO copywriting tips for every business. Anyone can use them to improve their content overnight. Will you?